Home Earth Changes Water disappears in the Pamlico and Neuse rivers in North Carolina! Water disappears in the Pamlico and Neuse rivers in North Carolina! 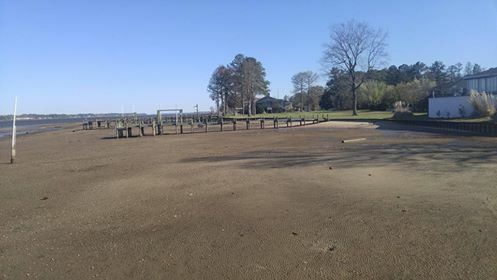 A follower of the blog just sent me some insane pictures of the Pamlico and Neuse rivers, two tidal rivers that flow into Pamlico Sound in North Carolina in the United States, almost completely dry. 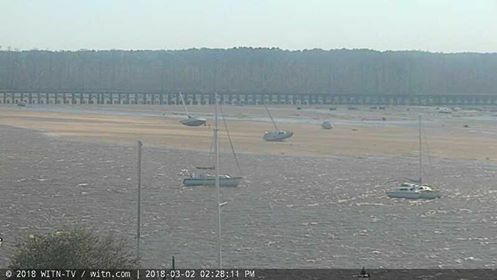 Strong northeast winds across Eastern Carolina are causing some river banks to become high and dry. 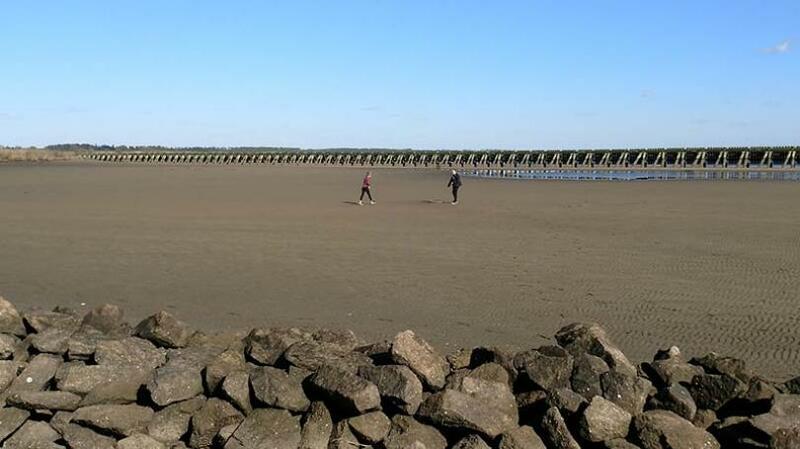 In Washington, the Pamlico River has set a new record for the lowest water level. The river stands at -3.81 feet, breaking the old 1989 record of -3.70 feet. Strong winds are pushing the water out. At the Washington boat ramp the ramp is hardly in any water at all. 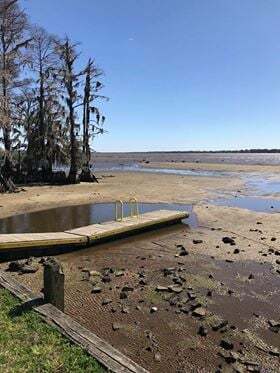 Similar problems are also occurring in New Bern at both Union Point Park and Lawson Creek Park where water from both the Neuse and Trent rivers are being pushed out. Here some more pictures from Pamilco River on Facebook. Is the water receding phenomenon due to the bombogenesis winter storm Riley currently engulfing the US East Coast? Or is this weird event due to the full moon tides? It seems that both events have a large effect on the tides… A totally unusual effect. 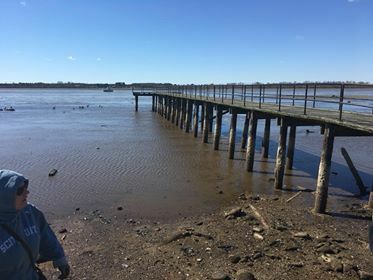 according to the timestamp in the picture, i had been over the bridge at around 1 and definitely not that low, seen a little sand bar, but not as far as gone as picture is shown. There is a link to Facebook pictures in the post… It shows an even worse level. Have a look. The same person also posted a video of the phenomenon. Insane! Ou encor e est ce un effet d’eau dans une cuvette, quand le basculement des poles se réalise? Il n’y a pas à supposer car c’est une réalité! La boule bleue s’inclinant les flots vont et viennent en surface! Nous arrivons à la fin des temps, la dernière Cène, celle de la destruction par le chaos, génome du chaos attenant à l’ADN de chacun des vivants. C’est pour cette raison que tous les médias occultent cet état de fait, préservant ainsi une certaine paix dans les pays qui commencent à s’échauffer par manque de nourriture, alors un écran de fumée nommé GUERRE éteint toute remise en question sur ce qui se passe. Whats so interesting (also) is during the Spring Summer & Fall month’s out of the years (anymore) is the low humidity. Throw this in with the (constant) windy days the soil dries out quickly. I’ve been around (a few years) & w/out a doubt something very sinister is going on – All one has to do is check out all the patients on weather modification – BUT, there is Another Power throwing curve balls at the sinister ones! This type of event has been occurring in many areas of the earth. Most recently in south america countries who coast lines border the ring of fire. This is a major concern. Why, prior to the last two-three 6.0 plus major quakes, it was reported regarding water disappearing from Harbors/shorelines leaving small sailing/fishing boats stranded . Scientists report that this event is caused by the tectonic plates slipping, creating a void and water fills that void, as I understand it. When the plates reset, I guess the water is expelled which is some areas, creating excessive high waves on other shores, sometimes on the same side or opposite side. Also occurred just recently before the landfall of Irma, I think in Florida, Tampa Bay had a similar event in where on the Gulf of Mexico side water disappeared from the Bay as reported by the weather channel. areas and other ideas based on data collected. 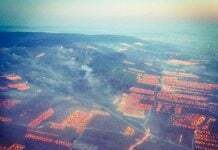 Has nothing to to do with a pole shift, Planet X, weather modification, aliens, etc. it’s a pure weather phenomenon high winds from the northeaster, coinciding with a full moon. It will be back to normal by the first of the week. Stop reading every weather event as something to raise the eyebrows. Why not connect it with Billy Graham(RIP) passing as well? Thankful the moon was not a blood, full, blue moon, if it was we would have people jumping to their demise. I live in NC, it has happened before so stop freaking out. I never said anything about aliens or weather modification,Billy Graham… etc. I simply pointed out that evidence from previous reports stating that on several occasions when there was an abnormal shift in coastal waters, rather receding at one point and the increase of unusual tidal waves in another (without a storm effect) has on several occasions preceded a major earthquake. Most recent was Costa Rica, three months ago 6.4. Not freaking out, reviewing recorded associated observations. It’s not high winds, although the winds add to the problem. The problem in continental roll caused by the push and pull of the approaching Niberu system on the crust. Funny how those strong winds haven’t blown away the trees, boats, and buildings along the shore. Water is really heavy. How much wind force would it take to move that much water? And why don’t we see this all the time, if it’s only wind? 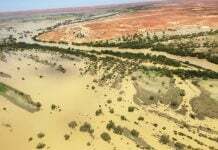 People living in the region say they’ve never seen the river completely dry like this. Qanon posted up Watch the Waters for months early this year. So us internet researching diggers who hack a bit dug. You normies if you only knew what we found hidden on the web from you. You call us tinfoil hatters. The truth comes out eventually. We are watching the data on the coasts and checking the data from other science groups ..even if we have to go in the back door without their knowledge. Something is up and amiss. This is not a small mystery here or something to take lightly. I would take this with very grave concerns. Investigate this people….we are. Do a search of the last 2 months..there has been super strange coastal occurrences ..rare ones that are commonly happening. 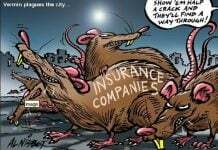 This is the key thing we have seen lately. You don’t have to believe in this Qanon and Anonymous official hacker groups….but we have been spreading hidden information for years now. We have proven our credibility in finding secrets to share to you. Keep watching the waters…report what you find please. We are watching and collecting all the data we can. Some of the more xtreme claim this Niburu is in the solar system. I have my doubts…but yesterday we launched a planet finding probe. (why? spend billions on something that is just science info only? its not science info only…they are checking for this Niburu planet. Be worried, we are. If there is any semblance of evidence of this….we have data on these events in the past shown by geological time lines in the dirt. Have fun normies with the tidbits I tossed out. We call those crumbs. It’s up to you to dig on the crumbs I gave. I recommend you normies do the same on this. Please provide data public. We are watching to. You call us the conspiracy theorists, truthers, hackers, net nerds..what ever. We have been digging. We have been going into back doors to get data. We have found some stuff that we are piecing together. All we know is watch the waters…and what you show and I have found….its starting to worry me a bit. I don’t know what Qanon wants us to find here…but we are still digging. The others are digging into political cia stuff. Some the cabalists and Hollywood and pizzagate. Im with the crowed looking into archeology and science data. Normies and sleepers (you guys), You don’t have to believe Anon official or Qanon. Your eyes and evidence is in front of you the data we have been told to look for. Strange isn’t it. Do you believe in coincidences? How many coincidences does it take to be not one ? Mathematically its impossible to have repeat coincidences. This tide pull out has happened on several coasts now…all say..never has seen this happen ever in their lives. Not even established multigeneration families have stories on this. They to are dumbfounded.